Last week, Clotilde at Chocolate & Zucchini wrote about Absorption pasta. It fit right into my latest project of finding things to cook that won't heat up my apartment during the dog days of summer. This fits the bill. You basically cook the pasta like risotto--putting it in a skillet with a small amount of liquid and simmering it in the liquid, adding more liquid as necessary until the pasta has reached the desired consistency. Clotilde's version included zucchini sticks, parmesan flecks, and cacao nibs (something new to track down). It looks so sophisticated sitting in its little bowl--so delicate and exotic. Mine looks like a poor country cousin in comparison but, like most peasant food, was hearty and satisfying. This dish was a challenge to make. For one thing, I wasn't sure how it would work with whole wheat pasta. But the more I thought about it, I decided it really shouldn't make that much difference--it should absorb the liquid just as easily as regular pasta. Another thing I like about this dish is that you can cook as little pasta as you like--enough for one serving. Of course, you can cook just one serving's worth of pasta the traditional way as well, but that has always seemed like such a waste of time, water, and effort. This takes about as much time to make as boiling pasta (if you take the time it takes to bring the water to a boil into account), but it doesn't feel like it's taking as much time because you're not spending so much of it looking at that big pot of water, waiting for the boil. On Friday I mentioned that one of my plans for this blog is to experiment with finding healthier ways to make old favorites without sacrificing flavor. Another goal I have is to be more flexible and creative with my cooking. Rather than following recipes all the time, and shopping accordingly, I plan to shop more based on what's freshest and cheapest, and then put meals together based on what's in my refrigerator or pantry at any given moment. This new way of cooking pasta seemed like the perfect opportunity to implement my plan to cook with what I have on hand. There were some Trader Joe's frozen roasted red and yellow peppers that had been in my freezer forever, for which I did not as yet have a specific use in mind. I wanted a change from my usual tomato-based pasta sauce. 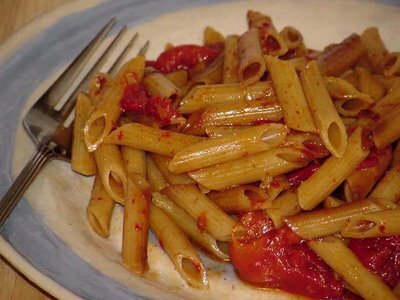 The minute I thought of pasta and roasted peppers together, I knew it would be a good combination. A handful of crushed red pepper gave it a nice Arrabiata zest. And I had cooked up some chicken a few weeks ago so I have several jars of stock on hand in the freezer. It was quite good for a first effort. Unfortunately, I scorched the pasta, so it absorbed the liquid unevenly. But it cooked just fine, and was super silky and flavorful as a result of this method of cooking. In other news, I see that I've had a visitor from Hong Kong who came through Mary's blog. Yamilett is that you? We're missing you and thinking about you lots! Heat oil in large skillet. Add garlic and cook for approximately one minute. Add pasta and cook for two minutes. Add the 1-1/2 cups of stock (careful, it will splatter) or enough to just cover pasta. Lower heat, cover and simmer for approximately 20 minutes, stirring occasionally. Around 15 mintues into the cooking, add the roasted peppers, salt, pepper, and crushed red pepper. Taste pasta for doneness. If the water is absorbed before the pasta is done, add more as necessary. Adjust the seasonings and transfer the contents to plates. Enjoy. Makes 2 large or 3 small servings. you can get cacao nibs at whole foods, near their coffee/chocolate section- scharfenberger makes the only kind I have had. Hi Debi! I miss you too! It's not fun knitting alone. I have finished the gored insert skirt, the intarsia rowan felted tweed sweater, and a little scarf made with Jaeger merino I bought from the knitting workshop sale bin. I finished the sari ribbon vest from Teva Durham's book.. That's it, need more. I wish my yarn would get here already. I'm going to a few yarn stores today to see what there is. So can you start your project now?? Hint hint. It's already begun. I'm sending you an email . . . Good to hear from you!